Not to be confused with Cameron Jordan. Jordan Cravens Cameron (born August 7, 1988) is an American football tight end for the Miami Dolphins of the National Football League (NFL). He was drafted by the Cleveland Browns in the fourth round of the 2011 NFL Draft. He played college football at USC. Cameron was born in Los Angeles, California, the son of Cathy (née Cravens) and Stan Cameron, who works for a telecommunications company. He was raised Mormon (LDS). Cameron attended Newbury Park High School in Newbury Park, California. He made the All-Marmonte League first team in 2005 as a junior. As a senior in 2006, he made Prep Star All-West and once again made All-Marmonte League first team. He caught 73 passes for 1,022 yards and 12 touchdowns in his senior year. He was a teammate of former San Jose State' quarterback, Jordan LaSecla. He also starred in basketball and volleyball at Newbury Park High. After high school, Cameron decided to play basketball at Brigham Young University rather than football. After redshirting his freshman year (2006–07), he decided to give football another try. 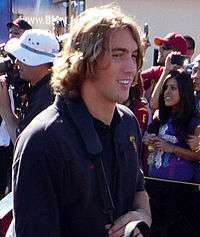 He transferred to USC in 2007 to play football as a wide receiver. However, when USC refused to accept some of Cameron's credits from Brigham Young, he was forced to withdraw and attend Ventura College. He missed the football season but was given the option to try to rejoin the team in 2008. Even if he had stayed at USC, due to NCAA transfer rules he would have been ineligible to play in 2007. Cameron ended up enrolling at USC a year later and saw brief action for the Trojans at wide receiver in both the 2008 and 2009 seasons, but did not make any catches. Prior to his senior year, he was moved from receiver to tight end and really embraced the move. In his final season at USC, Cameron caught 16 passes for 126 yards and a touchdown. After his senior season at USC, Cameron was invited to play in the East–West Shrine Game where he made a big impression on the coaches during the week of practice. Cameron helped his draft stock significantly during his workouts at the NFL Combine. He was in the top three of every drill he participated in and fifth in bench press reps. He was projected to be a mid to late round pick in the 2011 NFL Draft. Cameron was selected by the Cleveland Browns with the 102nd pick in the 2011 NFL Draft. On December 27, 2013, Jordan Cameron was voted to the Pro Bowl. Cameron signed a two-year deal $15 million (with $5 million guaranteed) with the Miami Dolphins on March 12, 2015. He was placed on injured reserve after suffering a season-ending concussion injury. His sister Brynn played guard on the USC women's basketball team (and is also the mother of Matt Leinart's child and also NBA Star Blake Griffin's children) and his younger brother Colby was an undrafted free agent quarterback for the Carolina Panthers but released before the 2013 NFL season. He is also the cousin of Washington Redskin's safety Su'a Cravens. ↑ Jorrey, Kyle (2005-08-25). "Newbury Park's offense expects to thrive with its multi-Jordan attack". Thousand Oaks Acorn. Retrieved 2011-08-04. ↑ 2007 USC Trojans Football Media Guide (Section 3), USC Athletic Department, July 2007, Accessed May 30, 2008. ↑ Scott Wolf, Trojans busy counting scholarships, San Bernardino Sun, July 26, 2007, Accessed July 26, 2007. ↑ Markazi, Arash (2010-08-09). 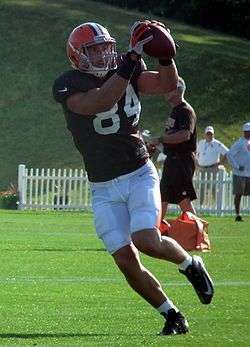 "Change welcome for USC Trojan Jordan Cameron". ESPN.com. Retrieved 2011-02-27. ↑ Lev, Michael (2011-01-20). "High praise for USC's Jordan Cameron". The Orange County Register. Retrieved 2011-02-27. ↑ Farrar, Doug (2011-02-26). "Jordan Cameron's draft stock could rise after great combine times". Yahoo Sports. Retrieved 2011-02-27. ↑ "Jordan Cameron Combine Profile", NFL.com, retrieved February 27, 2011 . ↑ "Jordan Cameron 2011 NFL Combine Results", ESPN.com, retrieved February 27, 2011 . ↑ "PRESS RELEASE: Dolphins Make Roster Moves". MiamiDolphins.com. November 5, 2016. ↑ Dan Arritt. "Su'a Cravens can lean on rich family tree". Retrieved October 16, 2016. Wikimedia Commons has media related to Jordan Cameron.